Tonight I made the most delicious Chicken Enchiladas, using this recipe from Cooking Light! I also poached for the first time. Let me walk you through the process. Poach 1 lb. chicken breast in enough liquid to cover the chicken. I kept mine at a very light simmer or less for around 17-18 minutes. 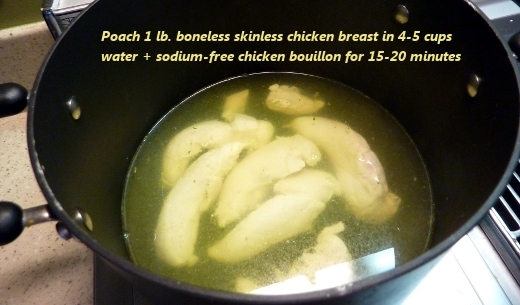 I also added a couple teaspoons of sodium-free chicken bouillon for extra flavor (addicted to the stuff!). Clearly I’m not a Poaching-Pro, so feel free to critique my method. Next I blended together a 7 oz. 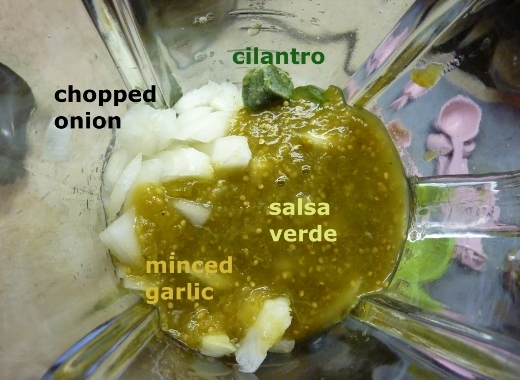 can of salsa verde, 1 cup chopped onion, 2 minced garlic cloves, and 2 frozen teaspoons of cilantro (sold at Trader Joe’s – so convenient). The recipe calls for 1/4 cup fresh cilantro, but I’m not a cilantro fan, so I just added in a tiny amount. The next step was the shred the chicken with a fork, and mix in 3 oz. 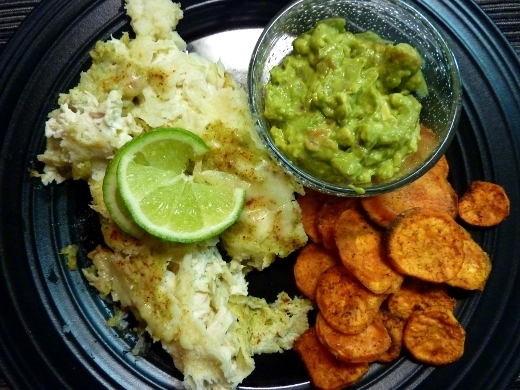 of softened cream cheese and 1/2 cup of the salsa verde mixture. 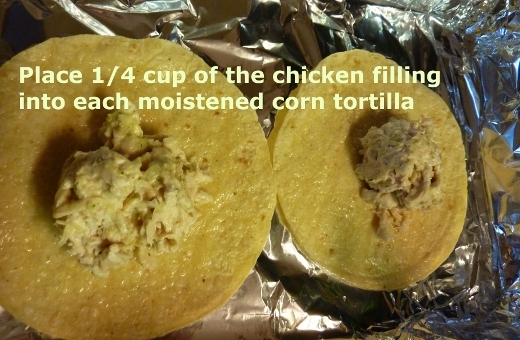 I added about 1/4 cup of the chicken filling to each tortilla. 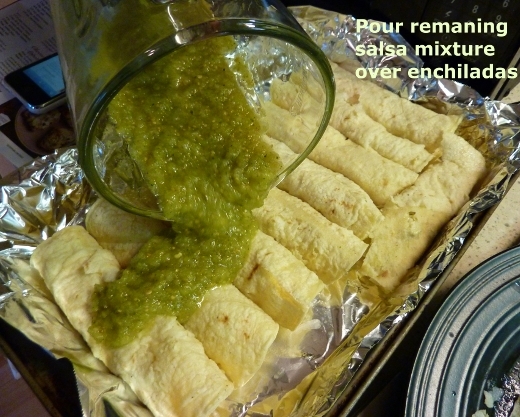 Next the filled tortillas were rolled up and covered in the remaining salsa mixture. A sprinkle of chili powder and these guys were ready for a 425 F oven for about 8 minutes. 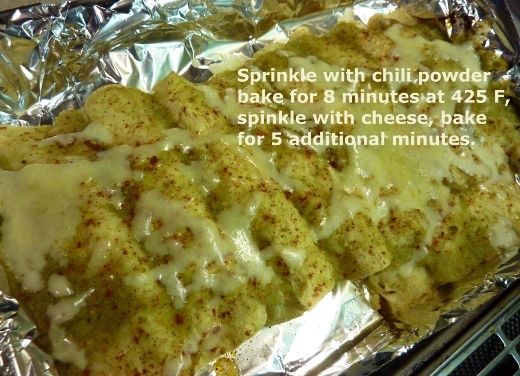 At that point, I removed the enchiladas, sprinkled about 1/2 cup of monterey jack cheese, and returned to the oven for 4-5 minutes until melted. This is less time than the recipe states, but that was all I needed in my oven. ♪♫ Currently listening to: Opiate – Tool.